MURPHY’S LAW – Getting to the playoffs accomplished the base goal of Dwane Casey’s first season as Pistons coach, but it would be tough to conjure a less favorable scenario that awaited them than what they got: the NBA’s best team over the regular season, Milwaukee, and without their leading scorer, All-Star Blake Griffin. The Pistons had to navigate a narrow channel to have a shot to stay in the game, one that involved limiting turnovers, winning the 3-point battle and beating the Bucks on the boards. Instead they played a Murphy’s Law game: whatever could go wrong, did. The Pistons shot miserably and didn’t offer much resistance against the Bucks early. Milwaukee had 25 points before the midway point of the first quarter and led by 20 when it ended and by 27 at halftime. With 4:07 left in the third quarter – with Milwaukee leading by 42 points – Andre Drummond was ejected after it was ruled his hard foul against Giannis Antetokounmpo was a flagrant-2 and Griffin was slapped with a technical foul. Milwaukee outscored the Pistons from the 3-point line by 21 points and held a 54-46 rebounding edge after a 32-22 first-half advantage. 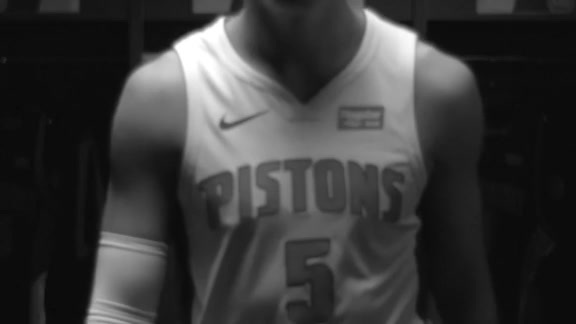 Luke Kennard scored 15 first-half points and hit 6 of 10 shots including all three Pistons makes from the 3-point arc, Kennard going 3 of 4 and his teammates missing all 10 of their attempts. Kennard led the Pistons with 21 points. A GAPING VOID – Blake Griffin’s sore left knee will have had a full week and a day off when the Pistons and Bucks tip off Game 2 on Wednesday night. Will that be enough to get him back in the lineup? The answer probably won’t come any sooner than 90 minutes before tipoff. That’s when Dwane Casey, in his mandatory pregame press conference, declared on Sunday what seemed almost certain over the last 48 hours as Griffin’s teammates talked about the challenge of facing Milwaukee without him. Thon Maker was the logical replacement for Griffin – his length and lateral mobility provide the best antidote for Giannis Antetokounmpo’s speed and above-the-rim playmaking – but he picked up two fouls in the game’s first 75 seconds. Maker missed all five of his 3-point attempts in the first half, only one of them from his preferred spot in the corner, and finished with four points and four rebounds, shooting 2 of 10 overall and 0 of 6 from the arc. Antetekounmpo didn’t have to exert himself with the Bucks taking a 20-point first-quarter lead that was never challenged. He put up 24 points and 17 rebounds in 23 minutes. OFF SCRIPT – The Pistons finished No. 6 in the NBA in 3-point attempts per game at 34.8 and the Bucks allowed more attempts from the arc (36.3) than any NBA team. But while the Pistons were getting buried under Milwaukee’s first-quarter assault, the Pistons took just one 3-pointer among their first 10 shots and finished the quarter with just four 3-point attempts in 26 shots. For the season, the Pistons took 39.4 percent of their shots from the 3-point arc. Wayne Ellington finished the season having taken 81 percent of his field-goal attempts from the 3-point arc, but his first six shots were 2-point attempts with his first try from the arc coming in the final minute of the first half. Pistons starters went 1 of 12 from the 3-point arc with Ellington finishing 1 of 4 and 2 of 10 overall. Between the disparity from the 3-point line and at the foul line – Milwaukee shot 18 of 26 there, the Pistons 8 of 13 with Luke Kennard hitting 4 of 5– the Pistons gave themselves little chance to keep the game close enough to make Milwaukee uncomfortable.